I'm a Student and a Blogger and so a post on the essentials for both could work quite well. I had thought about writing separate posts but when it came down to it the essentials were basically the same. So whether you're a blogger or a student, both maybe or even thinking of being either then post is definitely for you. First up, I'm talking gadgets and for me an iPhone is a total essential. Not only for day to day essentials like the Maps app to find your way around, well, anywhere, this baby holds so many things you could need. Yep, I'm talking apps. Photo editing comes for any Instagram addict both blogger and student alike. Now we've had Instagram for a little while the filters and ways of editing just don't quite cut it anymore and that's where these apps come in. Whitagram is great if you have a portrait or landscape you don't want to be cropped. It adds in a background that fits the Instagram square and you're ready to go. After using this app, I love adding in a pretty boarder on the A Beautiful Mess app, so pretty and totally adds to the interest of the image! Great for adding text too. For editing my favourite is Afterlight, it does cost a little fee but if you're after a free one then I've heard VSCO is a great alternative. Afterlight has all of the photo editing bits you could need and I love it. Sometimes I want to jazz up my image a little further and a light leak is straight where I go to and PicFx is the best for this. Organisation is key whether you're a blogger or a student. There's so many things to get done, deadlines, places you have to be that you need to make sure it's all in one place so that you're not as forgetful as I am. The Calendar app is AMAZING. I used to use a filofax and I loved having something written down but often forget to check it once I had written in it and therefore the object of it was kind of defeated. Enter the iPhone Calendar app and my life changed. It automatically syncs to my Macbook Pro and is always on my iPhone and well that's constantly attatched to me so I'll never forget what I'm doing. Plus it notifies you when you need to leave, bonus! Trello is another great app that I love to use for To-Do lists. You can get it on your Macbook too! Another app worth a MASSIVE mention is for all you students out there and it's RefMe. Typing out all of those references for essays can be a total nightmare and that's where this app comes in. Scan the barcode with your phone or search the what you want the reference for and the app writes out the reference for you. It's not always 100% correct but you get the gist of it and just add in the extra bits. Saves so much time and I've been obsessed ever since I came across it. So as you can tell, I'm a massive iPhone lover and with that then soon came my Macbook Pro. I honestly cannot tell you how much I love this. I was always one of those people that thought why waste your money on one when you can get a laptop so much cheaper, but I succumbed to the hype and bought one in May with my money from my 21st birthday and I've been in love ever since. It still confuses me a little from day to day but I love it so much and I'd never look back. I just love how everything syncs from iPhone to Macbook. It's so useful! Obviously though, when comes a computer, then comes the dreaded thing of not having enough space for all of your photos, videos and music etc. An external hard drive is a godsend for this and I honestly cannot recommend enough that anyone with a computer or laptop get one. I've actually got two... Pictured you can see the Samsung M3 Slimline 1 terabyte USB 3.0 Portable Hard Drive*. SO MUCH SPACE. I find that where I'm putting up videos on my YouTube every week, my Macbook gets full so quickly and I really don't like the thought of deleting all of my hard work and so that's where the hard drive comes in and I blooming love it. Alongside these gadgets, I would totally recommend picking up some insurance to go alongside them. I remember when I first got my Macbook I was terrified of anything happening to it. I literally treated it like a baby. I didn't want anyone to touch it as I was so scared of it dropping or breaking but it was the most expensive thing I've ever bought or owned so I guess it was only expected. Insurance2Go* is a great choice, all of the prices etc. are on their site and I've gone with them for my new iPhone 6. Its always a worry that something will be stolen or broken and so getting insurance just makes me feel so much more at ease as it feels like totally something less to worry about. I couldn't recommend it anymore. A great notebook is essential though as obviously you can't always have EVERYTHING digital and I fell in love with this Christian Lacroix* one that Bourjois sent me for Christmas. How cute is it? Almost too pretty to write in, but a perfect one to pop in your bag for on the go notes. 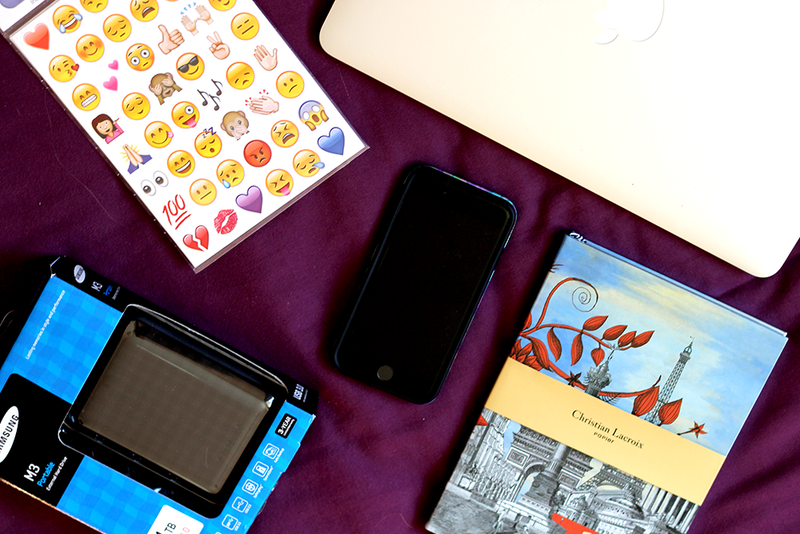 I also just had to give a mention to these Emoji stickers my bestie, Gemma from BeautySpotter. got me for Christmas. HOW AMAZING ARE THEY? Need I say anymore? Emoji Stickers... That is all. So these are a few of my essentials and I hope it's helped a little. I would love to know what yours are though as I'm forever looking out for more.